Thread by @VinayPrasadMD: "Looks like we need a TWEETORIAL about the FDA using surrogate endpoints to approve cancer drugs: Are you ready? Let's take a critical look a […]"
Do you agree: If you have cancer the only things that matter are quality or quality of life? Now, in cancer medicine there are 2 common surrogates PFS (progression free survival and response rate (RR). Measuring these quantities is not an exact science. DIFFERENT PEOPLE make different measurements. We only measure 3 tumor sites (even though there may be many). There are issues with censoring. Most importantly, how well do surrogates correlate with what we care about. For the record: I am OK with drugs approved via accelerated approval based on surrogates if OS or HR QoL is later demonstrated; What about you? Is 45% withdrawn or not completed post-market commitment something to celebrate? And, when these commitments are kept-- does that mean these drugs improve OS or QoL later? So, does the current study by FDA provide reassurance FDA is doing a good job with accelerated approval? What about the FDA's arguments that we can't test these drugs for OS or quality of life-- that's not fair! 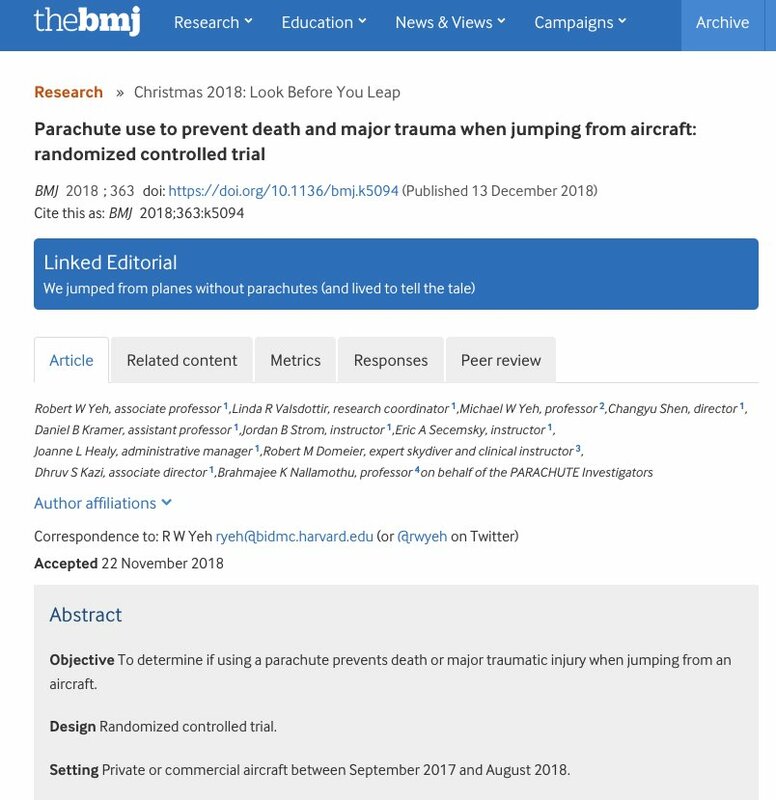 In short: does it seem astonishing to say that drugs used in terminal settings that do not confer cure cannot be tested for survival or QoL? 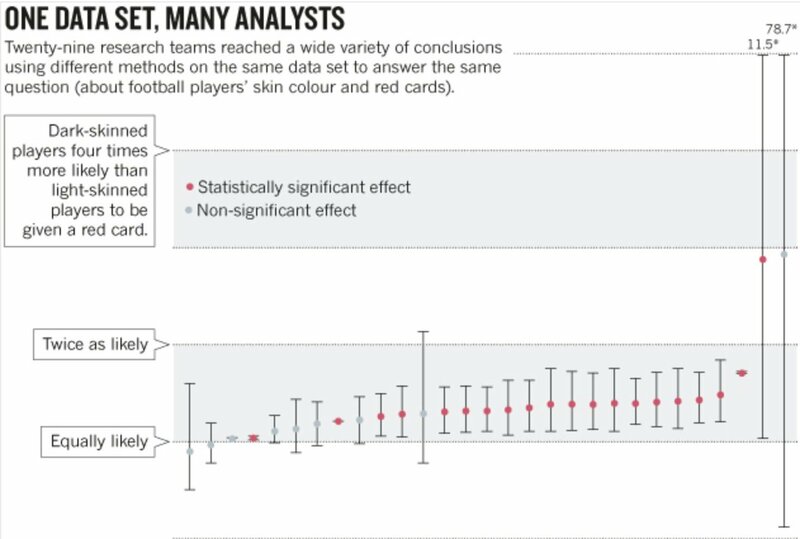 The point in this paper is if you give researchers the (a) exact same data set and ask the (b) exact same question you get a variety of answers. But unfortunately it furthers a narrative that is detrimental to medicine and scientific progress. Many may not see why. The history of EBM shows that many of these interventions fail upon rigorous testing. So if you are a proponent of an unproven intervention, how can you avoid the call to test it rigorously? 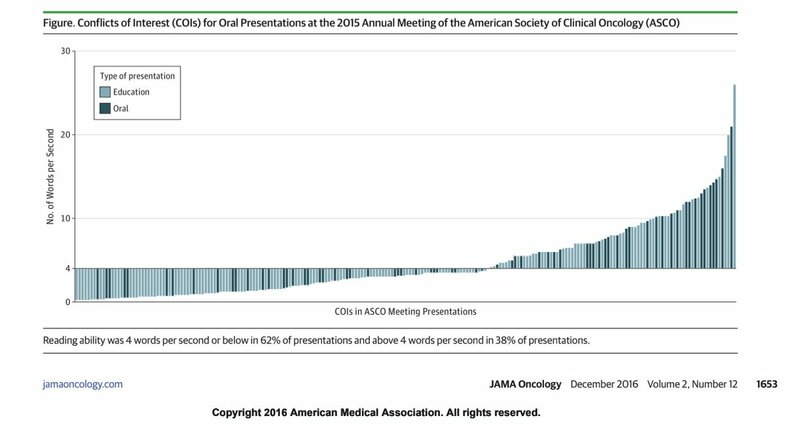 Aaron Boothby former @OHSUSOM student found 38% of conflict slides at ASCO flash faster than humans can read! I will now proceed to go on a #tweetrant / #tweetorial with regards to #Pharmaceutical #biotech pricing (focus on #cancer). Very timely, also see @WSJ wsj.com/articles/big-p… on price hikes. For the record, no #COI / #FCOI. Feel free to contribute to this discussion. Lets look at the problem from the @PhRMA / business perspective. And lets suppose you are a wonderful company, started by wonderful people who just want to make the world a better place (I know, not real, but stay with me for a minute). You start with a great idea / or pipeline platform and start selling this concept to #VC #VentureCapital, and lets assume that this is actually a really good idea. What is the needed return on investment to make this worth while. A: further R&D must exceed the cost of capital. THREAD: #FDA will continue to advance certain policy, consistent with what's permissible under law. Carryover user-fees support important actions, including developing guidance and advancing policies that further FDA’s regulatory oversight of medical products and animal drugs. #FDA will also use carryover funding to support development of medical products. This includes participating in pre-approval discussions with sponsors seeking guidance on how to go forward with clinical research and other ongoing discussions to help advance development programs. However, this doesn't mean it's business as usual at #FDA; the lapse in funding will limit many medical product related activities, including the development of certain guidances. We also cannot accept new applications for medical products that require the payment of a user fee. For this weekend's #FDA #SUNDAYTWEETORIAL I’m going to talk about what FDA is doing to modernize clinical trials to reduce the cost of drug development, potentially lower drug costs and bring more safe, effective therapies to patients. FDA’s mission is to both promote and protect public health. For medical products, this means ensuring that they are safe and effective for their intended use. 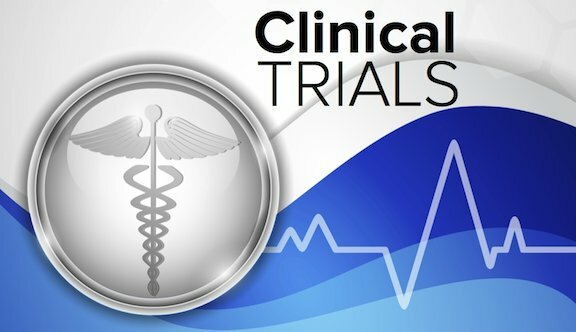 Clinical trials are the primary vehicle for generating the evidence FDA needs to ensure that. 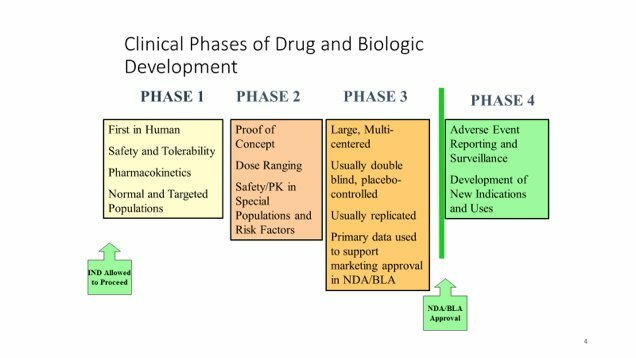 The traditional drug development paradigm calls for 3 clinical trial phases: A small phase 1 tests safety and dosing, phase 2 tests short-term side effects and effectiveness over a range of doses; and the large phase 3 assesses whether the product’s benefits outweigh its risks.